Two of our paintings are presented below, the majority of our paintings are local physician portraits. Most are housed on site. De Scott Evans was a prolific, nationally known painter of portraits, rural scenes and still lifes. He opened a studio in Cleveland in 1874, and was a founding member of the Cleveland Art Club in 1876. He moved to New York City in 1887 but continued to show his work in Cleveland, and at the National Academy of Design in New York City. 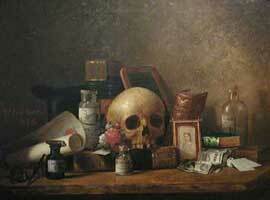 The Dittrick’s painting by De Scott Evans, Still Life: Medical Subject was painted in 1876 for Dr. H.C. Brainerd. The painting depicts objects common to a doctor’s everyday life, and some more personalized items, a cigar, a portrait of a woman. The bills of currency symbolize a bad experience for Dr. Brainerd. He was an official of the Euclid Avenue Savings and Trust Company , and lost his savings when the bank failed. This painting underwent extensive conservation in 1993, it was cleaned of old varnish, paints stabilized, and backing and tacking margins were strengthened. The painting was then loaned to the Cleveland Artists Foundation and the Western Reserve Historical Society for an exhibit and illustrated catalog entitled “Frederick C. Gottwald and the Old Bohemians”. The painting presently hangs in the eighteen seventies doctors’ office period room in the Dittrick Museum. Edmund C. Tarbell was a prolific Impressionist painter, a teacher and leader of the “Boston School” of painting. He began taking evening drawing classes at the Massachusetts Normal Art School while still in grammar school. Later he attended the Museum School and the Academie Julian and traveled throughout England, France and Germany. In 1886 Tarbell returned to Boston to begin a long and successful teaching and painting career. This portrait of Dr. Harvey Cushing was painted in 1908 when Dr. Cushing was Associate Professor of Surgery at John Hopkins Medical School. 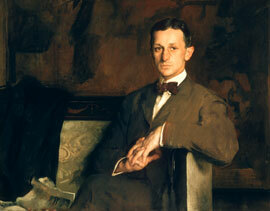 Dr. Cushing and Edmund Tarbell both owned houses in the same general area of New Hampshire and may have met through mutual acquaintances or through The Tavern Club or St. Botolph Club in Boston. The painting currently hangs in the Cushing room (main reading room) of the Allen Memorial Medical Library. In 2002 this painting was featured in a traveling exhibition titled “Impressionism Transformed: The Paintings of Edmund C. Tarbell”, prepared by the Currier Gallery of Art. *New York Times Magazine, “Important Picture by E.C.Tarbell Sold”, 9/16/17, n.p.